At that time Ravan, king of Lanka, was terrorizing the people, and all were longing for liberation from his menace. Ravan had acquired great power because he had obtained from god Brahma the boon that he would never die at the hands of gods, or gandharvas, or yakshas (demigods) or demons. As he was not afraid of men he did not care to include men in the list of his potential slayers. So Brahmadev declared that Ravan would die at the hands of a man. Then the gods went to Vishnu with the request, "Dasarath is a glorious king. Please, take birth in the wombs of his three queens in four different degrees of your divinity." When Dasarath's sacrifice came to an end a shining figure appeared over the sacrificial kund, and offered the king a divine beverage called "payasam" to be given to his queens Kausalya, Kaikayi, and Sumitra. 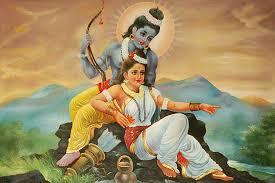 In due time Kausalya gave birth to Rama, Kaikayi to Bharat and Sumitra to Laxman and Shatrugna. 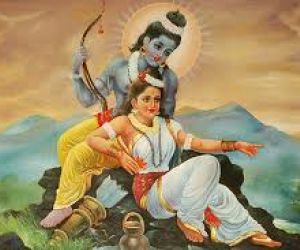 Rama was born at noon of the bright ninth day of Chaitra. He was believed to be the embodiment of half degree of Vishnu's divinity, (ardha ounsh).